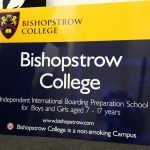 It seems like only five minutes ago that we were installing our last crop of educational signs, in institutions such as Amesbury CE Primary School, Studley Green Primary School, Kingdown School and more recently Warminster School. Summer is often when Wiltshire’s educational establishments keep us busy and this year was no exception. Here are three examples of our work for the county’s schools, colleges and nurseries. 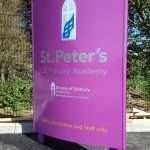 Firstly, we installed site signage for St Peter’s CE Primary Academy. 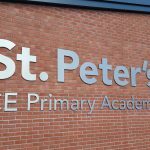 Located near to Salisbury, this is a brand new school within the Diocese of Salisbury Academy Trust. 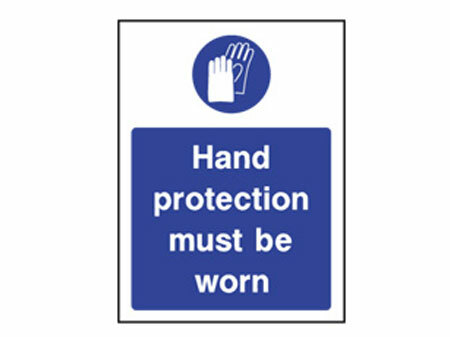 When we carried out our work, the site was rapidly approaching completion. 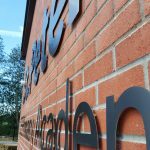 Working in conjunction with the designer, we supplied and installed three monolith signs along with sets of wall stainless steel lettering. 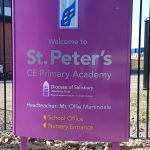 The school is due to open its doors in September and we wish all the staff and youngsters good luck for their very first term. Last but not least, we also installed a ‘V’ post mounted sign system for Bebetots Nursery in Westbury. 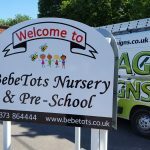 Rated ‘Good’ by OFSTED, Bebetots provides childcare and early years education for children aged three months upwards. 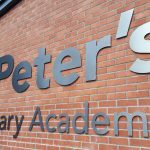 If the signage for your educational establishment – whether school or children’s centre – needs a refresh or rebrand, please get in touch. As you can see from the above, we’re not short of experience!